Strong poly zipper bags transport chemotherapy drugs safely. 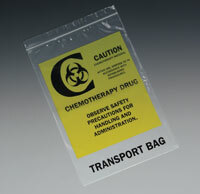 Preprinted Caution and Chemotherapy Drug Bag message alerts others of bag’s contents. Use bags to transport specimen containers from the pharmacy to patient and then to return empty containers back to the pharmacy.